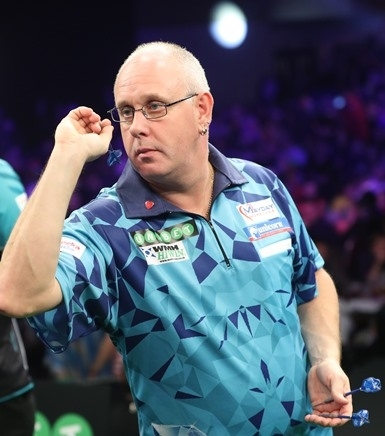 ‘Diamond’ sparkled in Maastricht to pocket the £25,000 prize but more importantly for the Unicorn ace, the biggest tournament victory of his darting career. He saw off surprise finalist Ricky Evans 8-5 to claim the crown in Holland and this win now takes White above Raymond van Barneveld into 11th spot in the world rankings. But what an achievement - to finally win on the big stage and it completes a superb couple of weeks for White. He’s signed a new contract with Unicorn and his run to the semi-finals on the Pro Tour this week puts him as provisional No.1 seed for the Players Championship Finals. He kicked off with a hard-fought 6-4 win over Arron Monk in Holland, before a 100 average saw off Mervyn King 6-2. In the quarter-Finals the Unicorn man brushed aside Adrian Lewis 6-1 and he then came back superbly from 0-3 down to beat Peter Wright 7-4 in the semi-finals. White always looked in control of the final against Evans, who had beaten Team Unicorn star Joe Cullen 6-5 in the quarters. Cullen missed three darts to go 5-3 up and then blew three darts for the match in the deciding leg. So to the final.....White started with a 14 darter then produced a superb 11 darter with an 81 finish to level at two apiece after Evans threatened to get on a roll. A 96 check-out saw White go ahead at 4-3, he then broke throw with another 14 darter and from there wasn’t to be denied. Evans did miss two darts to level at 5-5 and White held his nerve to close out the match. Big congratulations from everyone at Unicorn to one of the good guys of the sport. Unicorn’s Kyle Anderson had a good run to the last eight before frustratingly losing 6-4 to another surprise packet in Richie Edhouse. Team Unicorn Japanese ace Seigo Asada has taken another giant step on his road to the Alexandra Palace. 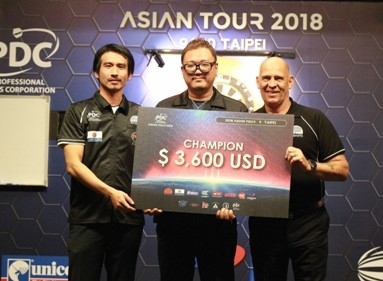 Asada has won his third event on the PDC Asian Tour and looks unstoppable in his bid to qualify for the World Championship. But he rode his luck! In the final Asada survived no fewer than EIGHT match darts by Paul Lim as he won a thriller 5-4 to claim Asia Tour 9 in Taipei. He averaged over 100 in his quarter-final and semi-final victories over Daisuke Akamatsu and Royden Lam before holding his nerve to beat Lim in that dramatic final. Lim though claimed victory in event 10 as he saw off Lourence Ilagen 5-3. Meanwhile it was the 4th weekend of the PDC Unicorn Challenge Tour in Wigan and again there were four different winners. On Saturday Jamie Hughes beat Kiwi Cody Harris 5-2, while Poland’s Krzysztof Ratajski, who also hit a 9 darter on the day, was a 5-2 winner against Mick Todd. And on Sunday at the Robin Park Arena, Cameron Menzies won event 15 with a 5-0 victory over Mark Frost, then Lee Budgen beat Michael Barnard 5-3 to take the final event of the weekend.